I hired Angela to do our living room in our newly renovated home. The space is a little awkward and she did a great job maximizing the space in a way that feels natural and totally fits our style. Angela is talented, attentive, creative and an absolute pleasure to work with. I know I will be asking for her help as we begin to decorate other areas of our home. Highly recommend! Angela doesn’t just deliver incredible interiors - she delivers complete peace of mind for even the pickiest of do-it-yourself decorators. Stop agonizing over your home and instead, turn it over into the hands of an exceptionally creative, responsive and budget conscious partner. 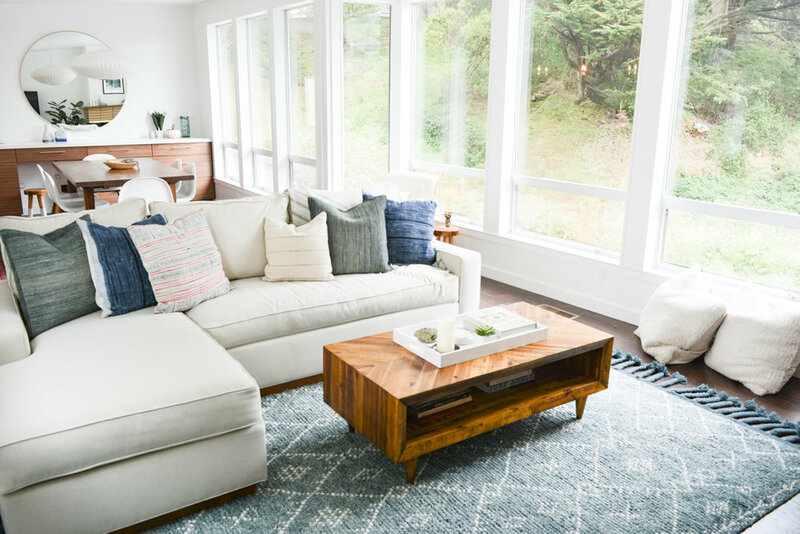 We worked with Angela for a total refresh of our four-bedroom Menlo Park home and could not be more thrilled with the process and the results. Snag her before the secret is out! Angela was so awesome to work with. We can’t say enough great things about her. We moved into a new home because we lost our home in the Santa Rosa fires last year. Needless to say we were so overwhelmed about having to furnish and decorate our new home. When we found Angela we were so incredibly impressed with her talent, creativity, kindness and compassion. We basically had her decorate and furnish the whole house. She really paid attention to what we wanted and needed and kept us updated every step of the way. On a scale of 1 to 10 with 10 being stellar, she was a 10+. Angela was an absolute joy to work with. 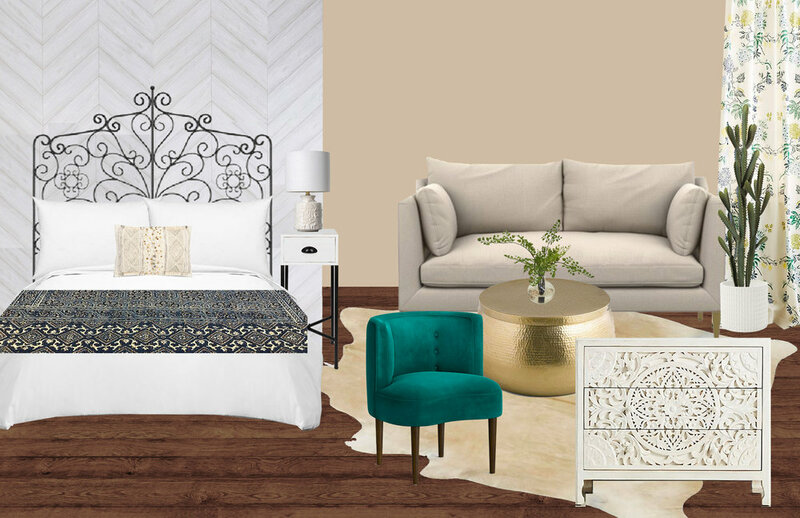 We enlisted her help with layout design, furniture selection, and decor for our living room, entryway, and master bedroom. We had just moved in to a new house and wanted it to feel like home - Angela made that happen! She was super timely with sharing her recommendations and was receptive to change as we decided to go a different direction on a few things during the process. She did an excellent job of incorporating what we already had and wanted to keep, and topping it off with fresh decor that will stay in style for a long time (and was reasonably priced!). We are so happy with how cohesive and bright those rooms are. We would definitely work with her again in the future and highly recommend for your design needs! I moved into a tiny apartment in SF without a single piece of furniture. I enlisted Angela's help to make the most out of my small space and was so pleased with the process and the results. She acted quickly by scheduling a call, stopping by my apartment to take measurements and following up with a layout and project scope. We then, worked together to decide on a vision of the space. She sourced pieces, ordered them or in some cases, went to the store to pick them up. She was very hands-on and helpful. Decorating an apartment from scratch can be stressful but Angela remained positive and believed in our vision, which allowed me to do the same. Now my apartment is complete and it feels better than I could have imagined. From a design perspective, it is beautiful but it is also comfortable and functional. I am stoked. The final thing I'd like to share is that working with Angela was actually way more affordable than I thought it could be - she found great deals on furnishing and often received additional designer discounts. Working with her was way easier than doing it alone, the design surpassed what I would have been able to achieve and it turned out to be so affordable. Thanks, Angela! Angela turned my bare studio apartment into my dream home! And she did so with high quality decorative pieces and furniture in an affordable manner. Angela was able to compliment my existing furniture with with some additional "wow" staple pieces (i.e. sofa chairs, media/entertainment stand, cocktail table, side table) as well as floor lamps, table lamps, artwork and plants that all blended perfectly to create both living and bedroom that space that is divided and spacious yet flows together in a very eloquent way! The design process was so easy, with me communicating to Angela my thoughts and preferred style and color schemes (which frankly wasn't a whole lot of helpful guidance on my part), and her taking it from there and running with it! The design boards were great visualizations of the space and she could easily swap in different pieces and colors with her own thoughts on the different looks to help me make decisions. She was extremely responsive and took care of all the ordering (and passing through discounts) which made my life that much easier given my busy work schedule! Finally, on the install day, she arranged all the manual hanging work and came prepared with tons of pillows, throws, and decorative pieces to bring it all together. I was amazed to say the least! Talent aside, Angela is such a kind person and was an absolute joy to work with. While I LOVE my new apartment, I'm already looking forward to my next home so I can experience another one of Angela's masterpieces! I can't recommend Angela enough. 2) She understands your vision through her questionnaire, through seeing your space and getting a feel for your style. 3) She's makes it easy! Logistically through purchasing/acquiring items as well as sending visuals and many options for the space. 5) She's invested in the space and the project. I will use Angela any time there's an interior need and I'd reco her as well! My family and I worked with Angela on two projects, and we would recommend her to anyone. She's the best, both in terms of her work as well as being an awesome person to work with. 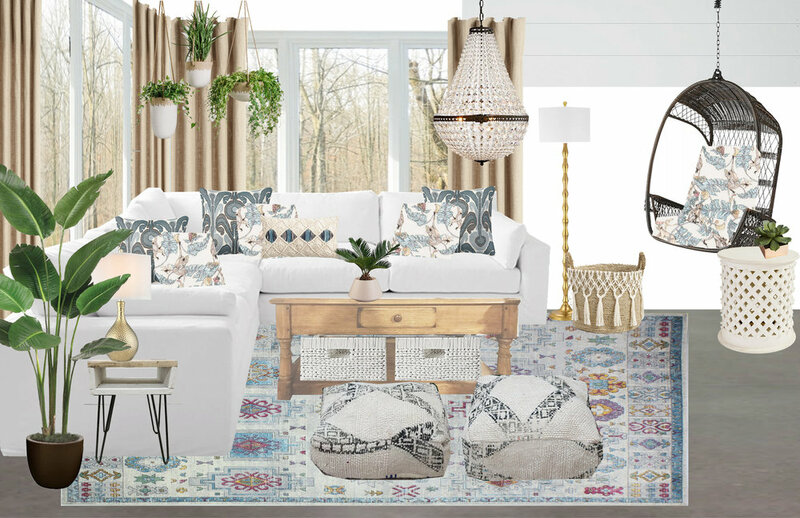 Our first project was to design our living room. Decorating is not a strength of mine, so I was really looking for someone who could get a sense of our family and come up with ideas. We also wanted to use certain old pieces of furniture, and had a fairly tight budget. Angela came up with a gorgeous concept that came out perfectly. It is the perfect mix of homey and refined, and she was able to work within all of our parameters, as well as the fact that we have three very young kids. She found things that look much more expensive than they are, and chose stuff that the kids still haven't managed to destroy, about a year later . . . We get tons of compliments on the living room, and it has made our home comfortable and welcoming. The next project was to design an-law unit (we call it the casita) in our backyard for a new au pair that we hired. This was something to be done from scratch, on a quick timeline and with an even tighter budget than our living room. We were extremely busy and stressed at the time, so Angela took care of everything. And I mean everything - she even did the shopping and picked out all of the small things our au pair would need to settle right in. On top of that, Angela came to set everything up at an extremely reasonable rate. I can't emphasize what a great feeling it was to come home from work and see the whole thing put together and looking even more amazing than in the pictures. The casita is exactly what we wanted - modern, cozy, and comfortable. Our au pair loves it. This was something that would have been incredibly stressful to deal with, and instead, by working with Angela, it was a pleasure. Every part of working with Angela was a pleasure, and we are planning to use her services for our deck, master bedroom, and dining room. I can't wait to see what she does in those rooms! I found Angela Grace Design by doing an online search for e-design services. For over a year I kept a Pinterest board with designers I really liked until I knew that I was ready to begin remodeling my home. That time came this past spring and I decided to start at the top of my list. I sent Angela an email and got an immediate and positive response to my inquiry. The first room that I wanted to tackle and test Angela Grace Designs on was my 6-year-old daughter’s room. I had already bought the wallpaper and asked Angela if she would create a room design around the colors and theme of the wallpaper. We emailed back and forth about the project and she was so positive and enthusiastic about it that it made me even more excited than I already was! We also scheduled a phone call so Angela could ask clarifying questions and to make sure that she understood what I wanted to accomplish. I can’t tell you how lovely it was to talk to Angela (and all the times we’ve chatted since)! She was patient with me (and my crazy ideas) and incorporated everything I wanted (only much better than if I was doing it myself!). She is very competent and experienced in creating a beautiful room (and when I have ideas, she very gently and professionally steers me away from those that obviously will not work). Angela’s e-design included a shopping list, layout, and inspiration board. She also answered all of my questions by email. Angela captured the look I was going for in my daughter's room - classy, tasteful, and budget conscious (at my request). The most amazing part is that her turnaround time was very fast and her responses to my questions were answered in the same day - often within the hour. (I imagine this might change a little once the word gets out and everyone starts hiring Angela for e-designs!) While working on my daughter’s room, I also hired Angela to do an e-design for my 4-year old son’s bedroom and she worked in the exact same professional and speedy manner on this job. Having worked with her on these two rooms, I knew that I wanted to hire her for all of the other rooms in my house! This summer, I have been working with a local contractor and an architect on remodeling my home and have been working with Angela Grace Design on the finishing touches. She has an amazing aesthetic (check out her Instagram!) and I am so grateful to have the opportunity to work with Angela Grace Design. I will update this review with photos in the next few months. Get ready to be wowed! I highly recommend working with Angela! She is punctual, pleasant to work with, professional, always willing to help and go above and beyond. She is full of ideas and will listen at the same time and deliver options that suit the client. She is reasonable with her requests, honest and transparent and most of all her sense of style is incredible. Not to mention, her knowledge and experience on retailers— she know who sells what best! We love Angela and thanks to her we have the most beautiful nursery for our baby daughter. I love everything about Angela! Her demeanor, design eye, and availability were all just so wonderful to work with. We are about half way through my apartment re-do and I am so in love with my space, more and more every day thanks to her! She always listened and understood my style right away. She could come up with alternatives if I was not crazy about something. She gave me so many options to make my space my own! I can not recommend Angela's services enough. She took the time to listen to what we were looking for, reviewed my aesthetic by asking questions about preferences, and provided some amazing options all within my budget! Angela was great to work with-very responsive. She was able to find reasonable priced items that fit our taste. She was willing to try different options when I made suggestions. She offered suggestions. Very pleased with the experience and would use her again. Angela, thank you so much for your patience and quick responses on everything. The design is beautiful and I love how it turned out. I can't wait to get into our new home and get everything ordered. I will definitely choose you again if (read when) we do another room in the future. THANK YOU SO MUCH! Angela has great style and listened to our needs, stayed in budget, and followed through in such a timely manner. Thank you, for an amazing room. Beautiful! Great job!